Hello my fellow Essie Lovers! Welcome back for part 2 of my Coral comparison! 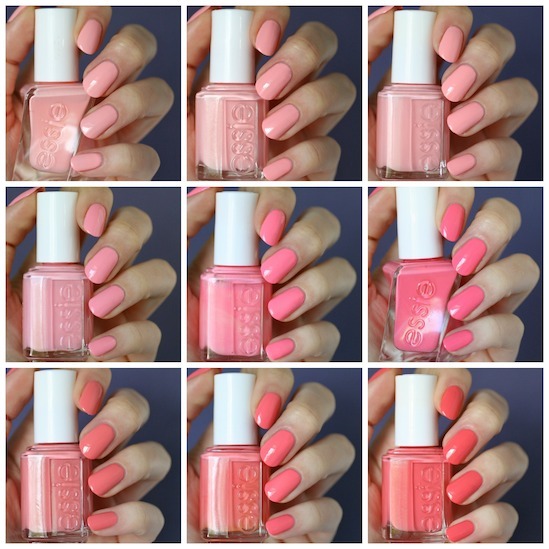 I didn't expect to be getting these posts up so quickly or this close together but I'm FINALLY getting my hands on the new Essie Bridal Collection, which of course I want to swatch and review ASAP, so in my mind that means getting ALLLLL of the coral posts done. So let's dive into these peachy-pink corals, shall we? I love, love, love this polish! As you can tell from the collage above, this pale peachy-pink coral is my jam. I love this polish because it's the long lasting Gel Couture formula. It needs 3 (sometimes even 4) coats to be completely opaque depending on how thinly you apply your polish or how picky you are, which is kind of annoying, but the nice thing is you don't have to apply a base coat which does eliminate a coat of polish overall. Despite the number of coats it takes, it's really nice to apply. Not too thick or thin and self-levels well (and of course, it has that glorious gel couture brush). The number of coats also doesn't effect the wear time since I still get a full week of wear out of this polish. This is a core Gel Couture that you should be able to find in most drugstores or online. I found it here on Amazon. Your eyes did not deceive you when you scrolled down. This IS the exact same colour as Couture Curator (although if you want me to be picky, Couture Curator is a hair lighter). Excuse Me Sur has a thicker formula that is opaque in 2-3 coats. I did 2 for these swatches but in my review I said 2 wasn't quite enough and I needed 3 that day. This polish self-levels okay. Excuse Me Sur just came out in the Spring 2017 B'aha Moment Collection so you should still be able to find it in most drugstores and online. I found it here on Amazon. 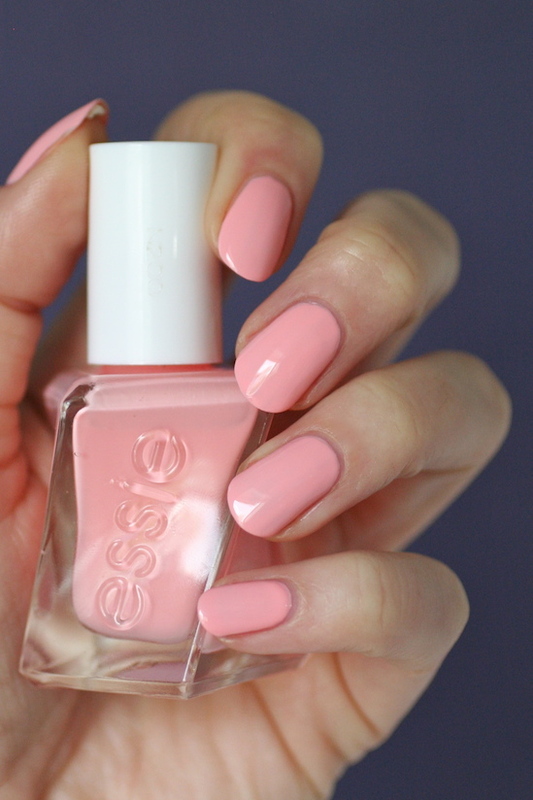 This polish has been one of my Favourite Essie's of all time. I just love this colour! 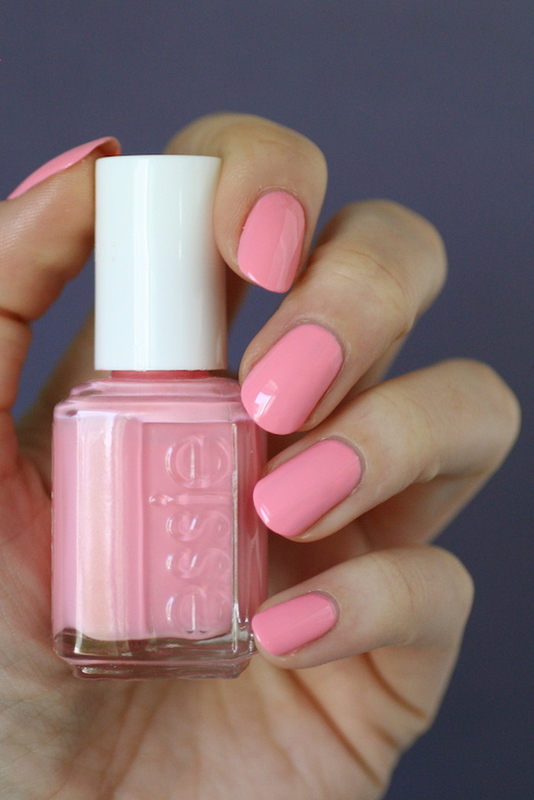 Obviously Essie does too because it's another dupe! This is the exact same colour as Excuse Me Sur but after swatching them back to back I like the formula of Excuse Me Sur Better. Van D'Go needed 3 coats to even out patchiness and it doesn't completely self-level. I needed top coat to smooth out the ridges for the photos. I also found the brush on Excuse Me Sur was slightly bigger, making it easier to apply. But honestly it's the exact same colour and the differences in formula are pretty minimal. If you have one, you don't need the other. Van D'Go came out in 2010 in the Art of Spring Collection but it was a popular shade so it was added to the permanent collection, so it's quite readily available in most drugstores and online. I'm frigging obsessed with this one! 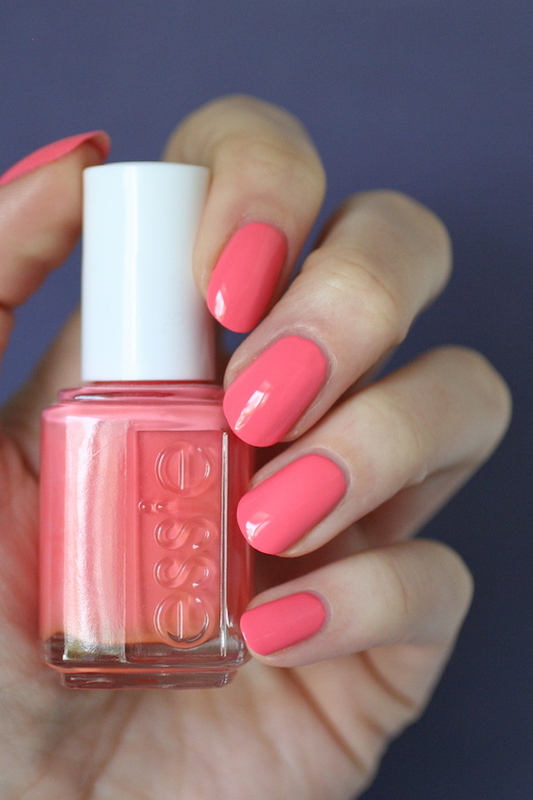 I was thisclose to putting it on my all time Favourite Essie's List (and I still might go back and edit it. I had 19 favourites so this one would make it an even 20) It's basically the pink version of Couture Curator/Van D'Go/Excuse Me Sur. It's really bright and beautiful. The formula is okay to apply. It's really opaque so it SHOULD be opaque in 2 coats but there were random uneven spots so it needed 3. It self-leveled nicely though (although in my original review I said I got lots of ridges that top coat evened out. Maybe I'm just better at polishing now then I was then?) This polish came out in Summer 2015 Neons Collection (but it's not a neon at all if that scares you). It was a discontinued polish so it will probably be harder to track down. Checking various online stores will probably be your best bet. I LOVE this one too! I posted it recently on insta and it got so much love. The formula is easy to apply and opaque in 3 coats. It dries down to a matte, so it must have some neon pigment in it because it is bright! A coat of top coat will make this nice and shiny. 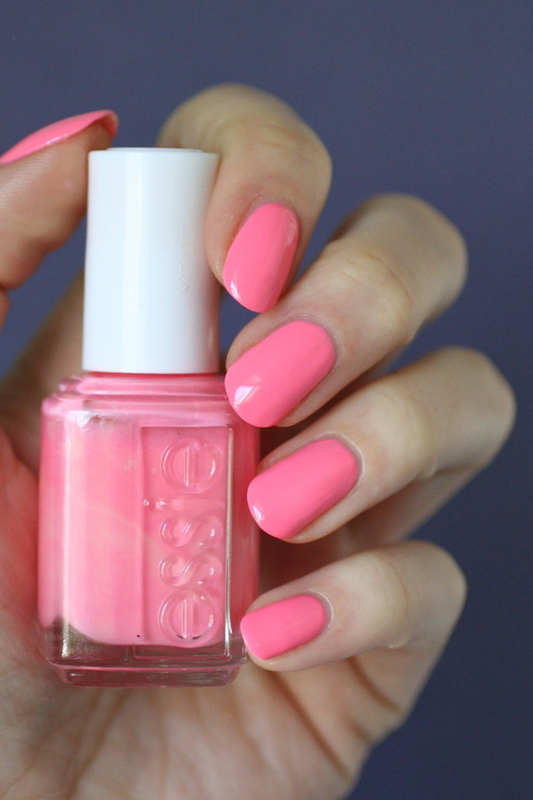 This polish came out in the 2010 Summer Collection. It's not part of the permanent collection but I can find it at my regular online places so it must've been added to the salon collection. Lounge Lover makes me think of a true coral. It's perfectly in the middle between pink and peachy orange. It had a nice formula and was opaque in 2-3 coats. Last year when I reviewed this polish I said it needed 2 coats but my nails are a lot longer now and I found a few nails needed that 3rd coat to cover up any unevenness. This was released just last year in the Spring 2016 Lounge Lover Collection but it was not added to the permanent collection. You'll probably have to track it down online since it will be long gone from the drugstore. Stones 'n' Roses is a dusty peachy rose and it applied nicely and was opaque in 2-3 coats. It also self-leveled well. This came out in the 2015 Resort Collection and I wasn't sure how I felt about it for the longest time and then finally my curiosity won out and I ended up ordering it. I didn't think I liked it at first, but it actually suits my skin tone! I compared it HERE to Peach Side Babe which came out that same year. 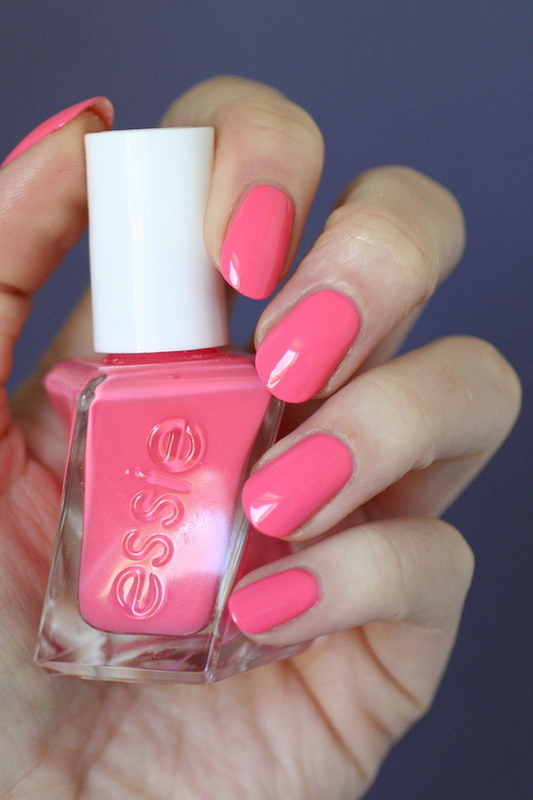 If you want a coral thats toned down and isn't so bright, a polish like this would fit the bill perfectly. This one was added to the permanent collection, but I'm not sure I've actually seen it in my local drugstores (but it might be there). You could definitely track it down online. 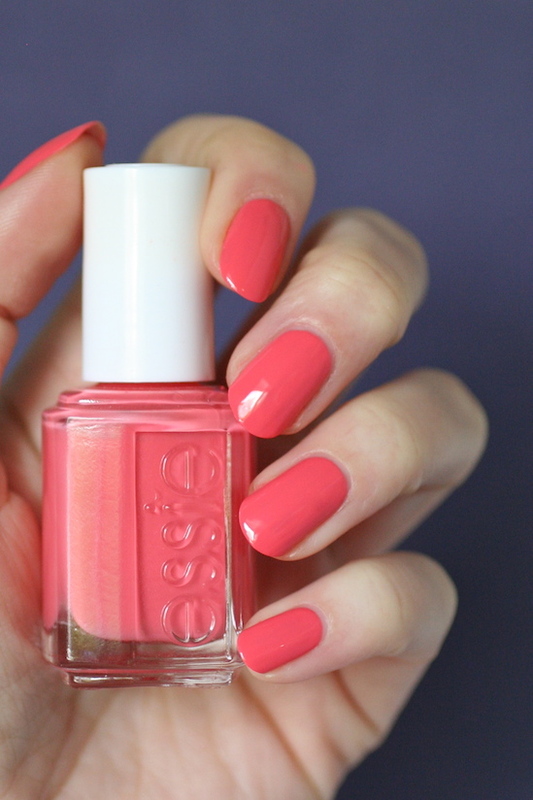 This is a random Essie coral shade that my friend Austrian happened to have. It applies nicely but was still patchy with 2 coats so it needs a 3rd coat. It self levels really nicely though. It had a similar dusty quality to Stones 'n' Roses but was a deeper, more saturated coral. This polish came out in Spring 2003 in a collection based on Central Park (which had super cute names like Lily Pond, Bike Ride and Plaza Sweet. Oh and Fifth Avenue came out in this collection!). If I remember correctly, Austrian ordered this one from sparklecanada.com. 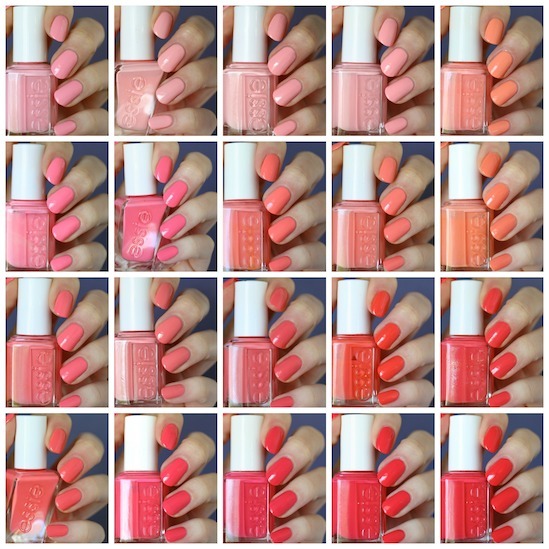 There are actually a lot of random coral Essie shades (some that I've learned about because of Jennifer and Abbi) like California Coral, Canyon Coral and Coral Reef, which were mostly released in the 80's. Abbi tracks hers down at Marshall's for a discounted price, but I've also see them on nailpolishcanada. I compared this one yesterday with the red corals, but the strong pink tones in it made me want to compare it here too. It's much pinker than Carousel Coral and it's a deeper shade than Knockout Pout. Basically I have nothing else like this medium pink coral shade. This is opaque in 3 easy coats. It's a core Gel Couture and you should be able to find it in most drugstores or online. I found it here on Amazon. Couture Curator, Excuse Me Sur and Van D'Go are most definitely dupes for one another. Couture Curator is a good one to get if you like your polish to last long, but either Excuse Me Sur or Van D'Go are good if you like to do nail art. Groove Is In the Heart is the pinker version of those three peachy corals. Lounge Lover, Stones 'n' Roses and Carousel Coral have some similarities but each has their own unique qualities about them. 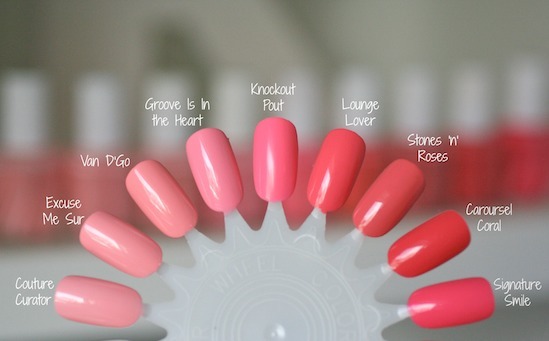 Lounge Lover is brighter while Stones 'n' Roses has that dusty toned down quality to it. Carousel Coral is similar to Stones 'n' Roses in that it's toned down, but it has more orangey coral pigment to it. Picking favourites from this bunch was easy! 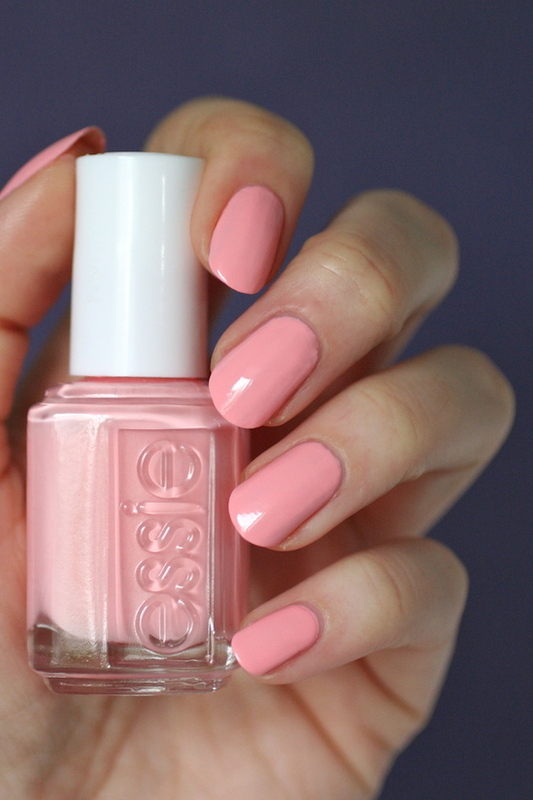 Obviously I love the peachy pinks, but I think I have to go with Couture Curator as my ultimate favourite. I like how it applies and self-levels and I LOVE the wear time. Groove Is In the Heart is definitely a favourite too! Oh and Knockout Pout! I like the ones that lean more pink on my skin tone and I love how bright Knockout Pout is. It wasn't released in a neon collection, but it's more neon than most of the recent neon collections. 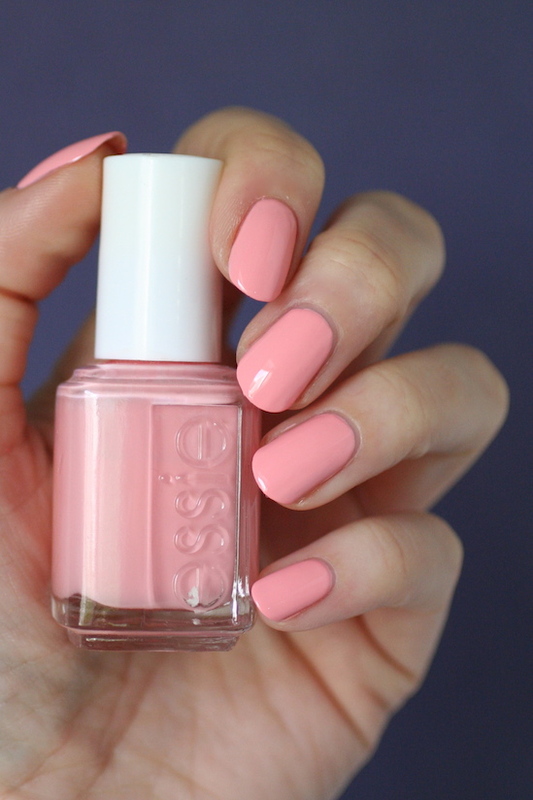 What's your favourite peachy-pink coral? To see the Pink-Red Coral Comparison go HERE. I have couture curator and it's a lovely colour. I kept seeing pictures of excuse me sur and van d'go and really liked them, but did wonder if they were too similar to couture curator and now I have my answer, so thank you for that. Oh thank you Bronco Mom! 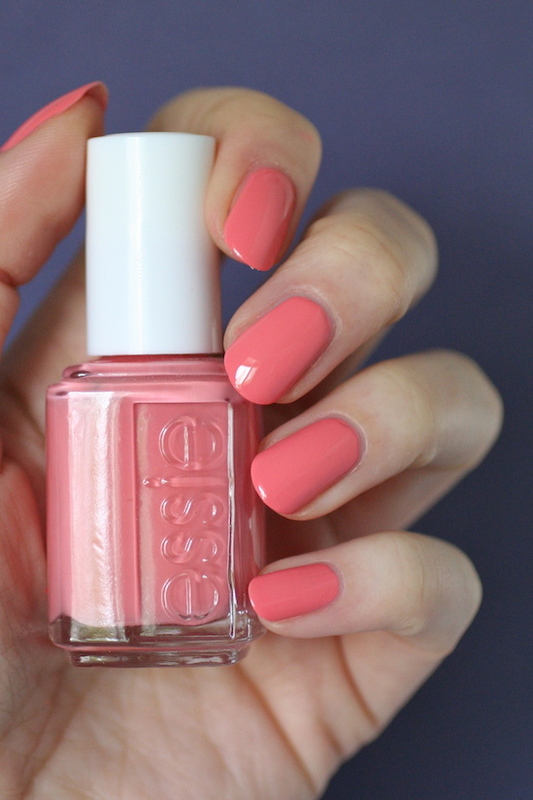 Ooh, what about including "Resort Romanza" in a coral comparison post? Were you able to get your hands on that one? I haven't actually worn Excuse Me Sur on my finger nails yet. I had someone put it on my toes when I got a pedicure. But given how thick it is, I might prefer Couture Curator's formula! I thought about adding it the red coral post but then remembered that when I compared it to Sunset Sneaks and Peach Daiquiri it showed up as a true pink with no coral undertones. Yes you might actually prefer Couture Curator! It doesn't even really bug me that it needs 3-4 coats because it's so nice to apply and it's so smooth and pretty. I'd rather have that then thick polish that leaves ridges.